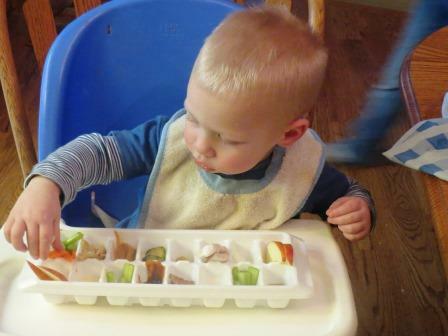 Years ago, when Natter was a baby, I saw this idea for how to get picky eaters to try new foods. Natter ended up being the toddler equivalent of a bottomless pit. Also, Rosebud and the Moose. So the idea was shelved in Mental Archives for a decade, and collected dust. Enter Junior, who positively hates new foods, and equally hates being spoonfed, unless it’s his idea. The Idea was resurrected, dusted off, and given a shot. 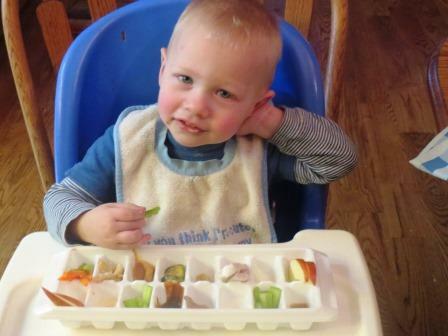 The Ice Cube Tray Sampler Plate! I have no idea who came up with this originally. It certainly wasn’t me. It does seem to be effective! He got an assortment of fruits, veggies and cold (cooked, obviously) meats that were in the fridge, and a variety of dipping sauces. I think we had peanut butter, cheese sauce, hummus, ranch dressing, Asian salad dressing and barbeque sauce. He didn’t clean his plate, but he did try everything, and most things got tried in multiple sauces. I’d say this one’s a winner. 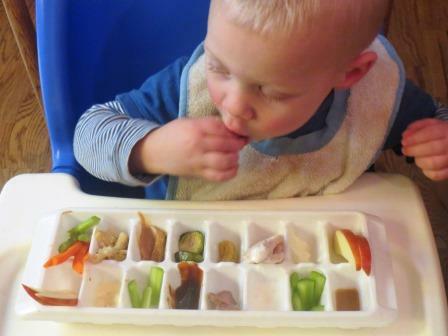 This entry was posted in Baby Food, The Inmates and tagged dipping tray for toddlers, get a toddler to eat, ice cube meal, ice cube sampler tray, picky toddler. Bookmark the permalink.